The 5 Best Barcelona Flamenco Shows for 2019 + How to Buy Tickets! We reveal the history of the passionate Spanish song and dance, along with the very best places to watch flamenco in Barcelona – and how you can buy your tickets online. Find your perfect show! 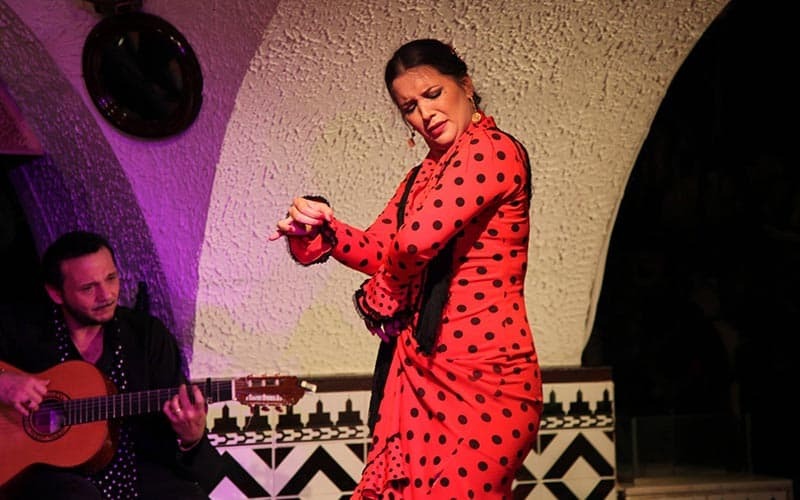 Flamenco – with its passionate cantes, gypsy guitars and flamboyant dresses and castanets – is the first thing that springs to mind when one thinks of Spanish culture (apart from maybe a spot of bullfighting, although that “sport” is banned in Catalonia). And although this lusty, life-affirming art form originated in Southern Spain, in Andalusia, Barcelona has its own close association with flamenco: after all it was here that the star-crossed lovers Juana La Zoronga and Rafael El Taranto fell in love in the famous Somorrostro shanty town and danced their way through the city in the hit 1963 musical Los Tarantos. The Somorrostro was destroyed in the 1980s to make way for the Olympic Games – although interestingly it was the real birth place of Carmen Amaya, a dancer and singer of Romani origin who starred in Los Tarantos. Flamenco has its origins in the folk music of Spain and was influenced by Spanish, gypsy and Moorish instruments and styles. The art form matured in the 19th Century when it enjoyed its so-called golden era and was performed in cafés cantantes around Spain. 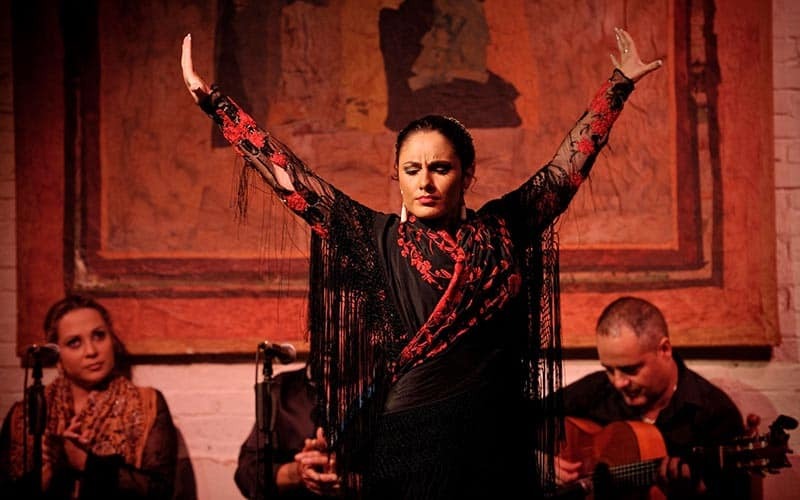 The medium consists of all three of song, music and dance, with the traditional view stating that flamenco began as a style of singing (cante), and later these songs were accompanied by guitar (toque), hand-clapping (palmas), foot-stomping (zapateado) and finally dance (baile). Some modern flamenco shows in Barcelona even contain an aspect of theatre, so that they become almost operatic or balletic performances. Flamenco has its origins in the folk music of Spain and was influenced by Spanish, gypsy and Moorish instruments and styles. The attraction of flamenco lies in its intense emotion, evoked in the songs and first-time goers will be surprised how soul-stirring (not to mention noisy!) the simple use of hand-clapping, foot-stomping and acoustic guitar can be, especially when these accompaniments build up to a blistering crescendo. Whilst the musical aspects of flamenco – sometimes tragic and dirge-like, other times light and humorous – arrest the ears, the dances meanwhile beguile the eyes: female artists perform sinuous arm movements and coquettish swirls of their shawls and dresses to stir the passions, whilst the men stomp and scowl, at one time spinning like a ballerina, at others striking imperious stances, much like a macho bullfighter commanding an entire arena! 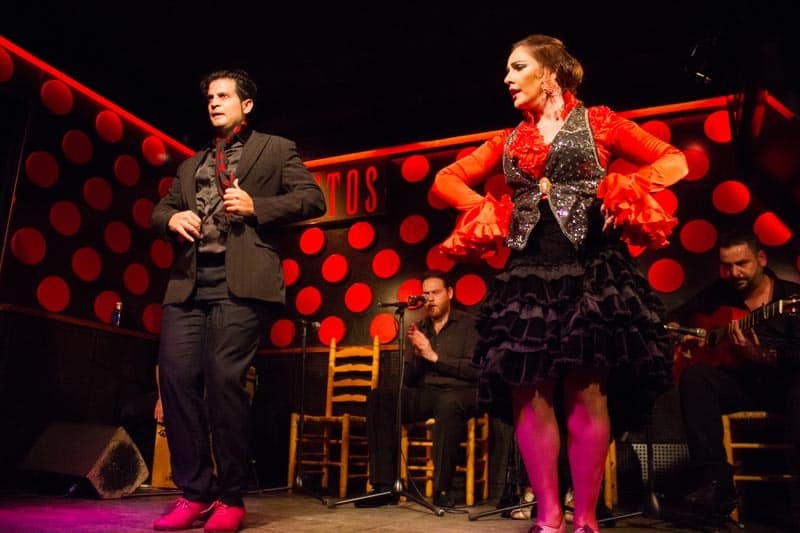 There are a host of sensational tablaos in Barcelona offering some of the best live flamenco shows anywhere in Spain, and if you’re dead set on witnessing the passion of a performance you’re in the right city. Whereas the traditional gypsy concert was a small and ad hoc affair, often with no telling when it would begin or end (if the artists even remembered to turn up at all! ), things are a bit more professional these days. Most of the top flamenco venues in Barcelona offer two or three shows a night, with the option to enjoy an in-house meal before the live performance. In essence these tablaos cater more for tourists than locals, but this is not necessarily a bad thing at all as it enables people to experience an important part of the cultural history of Spain. Meanwhile the concerts that take place in Barcelona are of the very highest order anywhere in the country. Generally speaking it’s a good idea to buy tickets at least a bit in advance, as the most popular shows will be sold out during summer. Below we list five of the very best places to watch a performance. 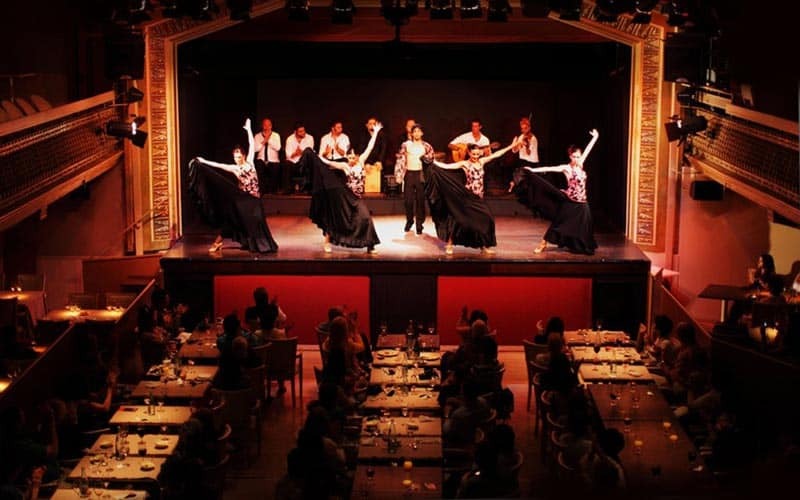 This elegant 1920s theatre was refurbished in 2006 and is now completely dedicated to the art of flamenco, with three shows featuring a troupe of 14 professional performers, playing every night, Monday to Sunday. 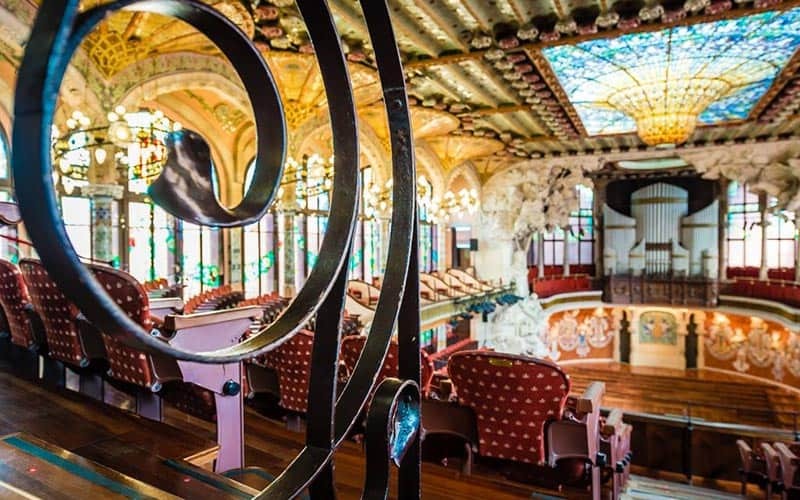 In fact, seating up to 380 people at one time, El Palacio is Barcelona’s biggest venue for catching a performance and has excellent availability provided you book a few days in advance (most nights it does sell out, so don’t hang around too long!). The show lasts for one hour and is very affordable at just €35 with a drink included, although most prefer to splash out a little extra and enjoy a typical Spanish meal with the concert washed down with traditional sangria. Their Paella Menu (€50) and Tapas Menu (€65) are very popular, and the quality of the food is better than 90% of other tablaos. Read more about tickets, dress code and dinner, or go ahead and book online via Get Your Guide. This popular venue on Las Ramblas has been a favourite with locals and tourists alike since the 1970s, and invites musicians from around Spain to perform in its cavern-like auditorium. The crowd are pushed quite close together to the stage, and the result is an intimate performance – in fact the artists do not even use microphones or amplifiers. There are up to five shows a night, depending on the day and time of year, each lasting about an hour. You can choose to buy a ticket to the show that includes drinks, or one that includes a buffet dinner with 44 tastes of Spain. Do note however that food and drinks are not served with the show, but eaten before the show in their Arabic-styled dining halls. Overall a great authentic experience right in the city centre. Read reviews of Tablao Cordobes here, or use the link below to book online. Could there be anywhere more appropriate to watch flamenco than in Barcelona’s very own Poble Espanyol, or ‘Spanish Village’? This tablao is named after Carmen Amaya (we mentioned her in the introduction!) and it aims to introduce its guests to all the most important traditional styles of flamenco, and highlight its different forms of expression: instrumental, vocal and dance. They put on two shows every evening, and – like with most venues – you can choose to buy a ticket that includes dinner menu (€80), tapas menu (€61) or just drinks (€43). The food here is of high quality, and we’d particularly recommend the tantalising tapas menu as the best value for money. You can book online via Barcelona Turisme, the city’s official tourism website. The Palau de la Musica Catalana is Barcelona’s UNESCO-listed concert hall, a beautiful red brick building designed in the Modernista style by celebrated architect Luis Domenech i Montaner (Gaudi’s teacher at one point!). Flamenco Art is a 1.5 hour concert featuring famous guitarists and singers from around Spain that takes place several times a month, from spring to autumn. You can reserve tickets online via Barcelona Turisme. If you want to experience the magic of Spain’s most famous art form, but without paying any of the inflated prices on Las Ramblas, then this popular choice might be for you. Start the night by visiting an authentic tablao on one of Barcelona’s best looking squares, for a fantastic half hour performance that will leave you in no doubt about the meaning of the mysterious ‘el duende‘ (soul, or spirit!) that permeates real flamenco! Then complete your Spanish-themed night with a trip to a local tapas bar to test some of the city’s most typical dishes. The total price is fantastic value at just €35. To reserve email us info@barcelona-life.com with your dates and group size. Our partners will get right back to you. When you book your tickets via the links above Barcelona Life earns a small commission on every sale. That commission is what helps pay for all the useful free information we provide on this website, and is much appreciated. If however you prefer to book via the tablaos’ official sites you can find them here. The prices are the same either way. Booked your place already and looking for other great things do in Barcelona? Then click here for some of our suggestions. Alternatively check out our concerts and gigs guide for other genres of music and where to hear them. Whatever you’re looking for in the capital of Catalonia we’ve got plenty of useful reading for you! And if you have any flamenco related questions drop them in the comments section and we’ll be glad to help.